Approximately a week ago, we tasted the 2006 Llavors from a winery in DO Emporda called Lavinyeta. Ryan bought it from a small wine shop in the coastal town of Estartit a month prior, while I was out biking the dirt trails; yet neither of us knew a lick about it, otherÂ than it was local, had a fabulous black and white label with a map of the region, and was in our price range. The winery is located in the small town of Mollet de Peralada, and to date, we’ve only had the pleasure of tasting one of their wines. In 2002, the family bought the land with little more than 2 hectares of 50-70 year old samso and garnacha vines. It wasn’t until 2006 a physical winery was constructed, eventually adding an additional 22 hectares to their portfolio. Owned by the Josep and Luis Serra Pla, having a little extra cash to invest, they embarked on a dream to not only elaborate quality wines, but to embody an innovative winery. inviting winemakers from the surrounding villages to a wine tasting of your wines, asking for feedback and ways in which you can improve your product in the coming years. going out and teaching your community not only about your own wines, but about wine in general through tasting in both formal and informal settings. celebrating culture by inviting 50 children from a local school to participate in the harvest, learning about which grapes to pick and which to throw away. listening to your consumer base and experimenting with ways of naturally reducing alcohol graduation without effecting the quality of the end product. collaborating with local chefs to design new products such as an Apple Mistella. producing an olive oil from Argudell, a native varietal that produces a dark forest colored liquid that smells of freshly cut grass. Beyond this, innovation can also be seen in their desire to create a brand based on the concept of storytelling. Whereby each of their wines play a significant part in how we share our personal stories. “Once Upon a time…”, called “Heus“, in Catalan is their base line of wines that consist of a red (36% Black Grenache; 33% Syrah; 23% Merlot; 8% Cabernet Franc), white (85% White Grenache; 15% Macabeu) and rose (27% Syrah; 26% Merlot; 25% Samso; 22% Black Grenache). “Then…”, called “LLavors” in Catalan, is made with 55% Cabernet sauvignon; 25% Samsó; 12% Merlot; 8% Black Grenache and aged for 5 months in new French, Hungarian and Rumanian oak. This wine was both surprising and intoxicating with a big round mouthfeel, great acidity and enough dark fruit, rustic herbal qualities and spice flavors to pair beautifully with grilled meat. If this is typical of their winemaking, we can’t wait to try the rest. 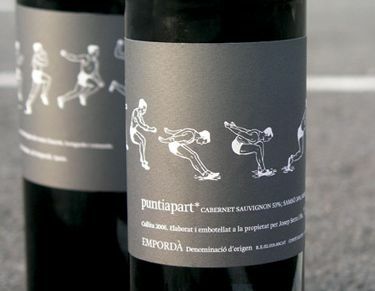 “The End“, called “Puntiapart” in Catalan, is made with 53% Cabernet Sauvignon, 24% Samsó and 23% Merlot aging for 13 months in oak. “Only“, called “Sols” in Catalan, is made with 50% Red Grenache and 50% White Grenache. The only place where I see their concept faltering a bit is in their website. Although I understand their desire to have you search through the site to uncover the story of their winery and wines, the end result is that of mass confusion and frustration. I found myself having to call Josep to give me instructions on how to use the site, and ironically found more information on their facebook page which was buried in a sub-directory. However, a website can be remedied, while making a good wine is not as easy to fix. So if you can get your hands on this wine while vising Spain, please do so! Currently, Lavinyeta produces 50,000 bottles annually and is in search of an importer. If you’ve tried any of Lavinyeta’s wines, please share your impressions with us below!